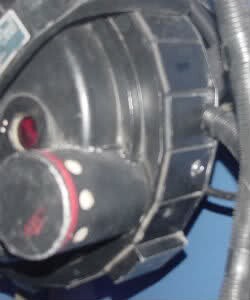 The Synchronous Generator comprises the bottom half of the Proton Pack. 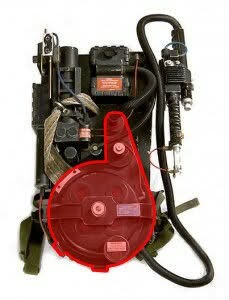 In appearance, it is little more than a spacer between the [/equipment/proton-pack/part-names/motherboard/ Motherboard] and the [/equipment/proton-pack/part-names/cyclotron/ Cyclotron], however it is a critical structure to the Pack since the Clippard Valve, [/equipment/proton-pack/part-names/cyclotron/ Cyclotron], [/equipment/proton-pack/part-names/bumper/ Bumper], [/equipment/proton-pack/part-names/n-filter/ N-Filter], and Ribbon Cable are all mounted on it. According to Stefan Otto's Plans and various reference photos, the bottom of the Synchronous Generator is not perfectly round, but faceted into 14 sections. However since the creation of the plans a 15th facet has been discovered and confirmed. Each facet is covered by cosmetic plating. There are 13 plates in all, plus 2 small boxes, one straight in the middle of the bottom of the Generator, and one on the lower left. In addition, one red and one blue length of 1/4" OD tubing travel from the Injector Tubes into the lower left box. In real life applications, synchronous generators are used to convert mechanical power to electrical power. A DC current is applied to a rotor, producing a magnetic field. The rotor is then turned by another power source, producing a rotating magnetic field within the machine. This rotating magnetic field induces voltages within the windings of the generator. This page was last edited on September 5, 2014, at 23:49.